Greetings from out here “on the road again.” Of course I’m writing this letter during July so it can go out to you August 1. I pray that it finds you on fire for the Lord and rejoicing in him this day. As I write, I’m about one-third of the way through this 36-day itinerary that will eventually take me to our Florida weekend, about which you can read a report in this FOD. I’ve not done such an extensive itinerary since back in the ‘90s when I traveled for as long as 76 days, and although it is physically challenging to both be with people so much (either on the phone in the car or in person in each city) and do all the other work of the ministry, I LOVE IT! I get to be with salt-of-the-earth people, both longtime friends and first-time acquaintances, and I get to share the Word night after night. Such a deal! As you may know, we started TLTF “from scratch” three-plus years ago without a dime’s promise of support. We stand in awe of what the Lord has accomplished with us in that short period of time. We have produced our fabulous foundational class, One Day With the Creator, as well as The End Times, both available on DVD and HD download; we have filmed 50 Good Questions and 50 Go(o)d Answers (now posted in writing and soon to be on video); we have a wonderful website with close to 150 YouTube teachings; and we have a growing network of affiliated fellowships. By the grace and mercy of God, we have done all this and more with an almost-exclusively-volunteer or part-time staff of people scattered all over the country. Only Franco Bottley is paid what could be considered a full time wage, and that is far below what he made as a graphic artist “in the world.” As you may know, I have yet to receive a salary, and have been basically supporting myself by teaching SAT Prep during the school year. That means I can travel to do ministry only in between classes except in the summer, when I can do what I am now doing. Whenever I teach, I put my Trader Joe’s Smooth and Mellow coffee can in the back of the room and enthusiastically give people an opportunity to give in response to a blessing, which is the biblical principle. I encourage them to give because I know what the Word says about it being a golden opportunity to prove God and see that He will multiply it back to them. For 45 years, He has proven that to me experientially in my own life. Even though none of my own income is guaranteed like with a salaried job, I give thousands of dollars each year to people all over the world—and God never fails to provide abundantly for me in amazing ways. Of course, He will do the same for you if you will simply “step out of the boat” in this area of your Christian life. 8:2 that in a great trial of affliction the abundance of their joy and their deep poverty abounded in the riches of their liberality. 7 But as you abound in everything—in faith, in speech, in knowledge, in all diligence, and in your love for us—see that you ABOUND IN THIS GRACE also. 24 Therefore show to them, and before the churches, the proof of your love and of our boasting on your behalf. 9:6 But this I say: He who sows sparingly will also reap sparingly, and he who sows bountifully will also reap bountifully. 2 Corinthians 8:24 echoes Cuba Gooding and Tom Cruise in the 1996 movie, Jerry Maguire: “SHOW ME THE MONEY!” Seriously—the Lord says here that giving of our material possessions is the proof of our love—for him and for our brethren. And he says that he will prove his love for us by multiplying it back to us abundantly. We in TLTF need your support, but only if you are giving “hilariously,” in response to the blessing that our work is to you. So if you do not have our video classes, please get them and see what they do for you. I will be 70 years old this November, and “retirement” is not in my vocabulary. I would like to retire from teaching SAT Prep so that I can do nothing but minister the Word to people down the homestretch of my life, but I can’t do so unless TLTF is able to pay me a salary. If you appreciate our work and you are not supporting us financially, please do so and see if the Lord blesses you in return. If you are supporting us, please consider increasing your investment, which will pay off both for you and for others whom we reach with the Truth. In any case, please pray for the bored billionaire whom the Lord wants to connect with us so that he can find a joyous purpose for his money. We have discussed, and are prepared to effectively use, such an abundance coming our way. We want to hire quite a few other people besides me who also have the ability to serve you in a particular capacity of ministry. We want to put hearing-impaired, Spanish, Chinese, Japanese, and other subtitles on ODWTC and TET. We want to produce more video presentations and books, and greatly increase our web presence. Hey, we’d like to have our own television channel. OK, I’ll do the Late Show. “And now, h-e-r-r-r-e-s……” Never mind. In that giving earns you rewards at the Judgment Seat of Christ, I feel it is apropos in closing to pass on to you what a friend shared with me. 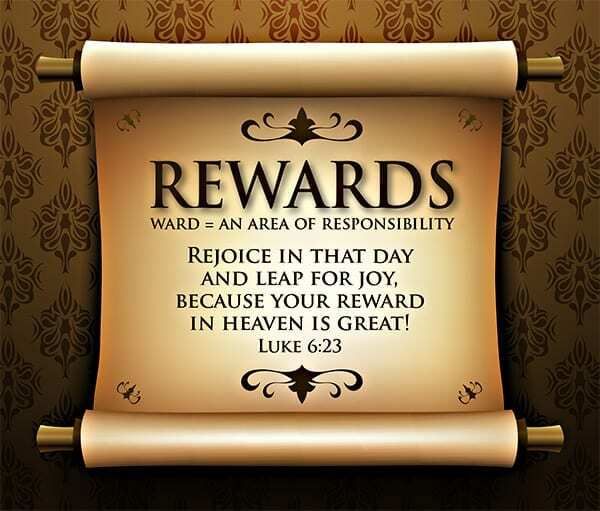 Consider the word “reward.” If it is a re-ward, then what is a “ward” to begin with? Besides being used in the context of guarding, as the inner court of a castle or fortress, or a prison, it also refers to a division in a hospital, especially a large room where a number of patients are accommodated. A prison has wards, and the person who is chiefly responsible for it is called the “Warden.” In hospitals, there are children’s wards. Simply put, a ward is an area of responsibility. In that light, each of us is the “Warden” of our destiny, and we are responsible to steward our lives accordingly. To “steward” means to manage another’s property or financial affairs; to administer anything as the agent of another. All that we have comes from God and Christ, to whom we belong, and we are to manage our resources so as to RE-WARD ourselves. Dare to trust the Lord Jesus in the category of financial giving; ask him if he would have you go beyond where you have ever gone before, and see if he does not astound you with what and how he provides for you, including a more intimate relationship with him.
. Scripture quotations marked (NKJV) are taken from the New King James Version® © 1982 by Thomas Nelson, Inc. Used by permission. All rights reserved.